Killer upgrade for your new Summit or E-Revo. This is for 1 pair of our 5000mah 7-cell flat packs. One left side and one right side. 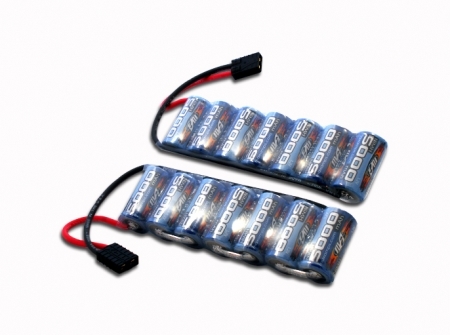 These packs will work perfectly with both a stock and upgraded Summit or E-Revo with no modifications required. I have a stock traxxas summit 1/10. When i got these about 3 weeks ago. i used them for the first time, this big truck goes pretty fast for its size and weight. They are worth the money. The run time with these is about 45min. These are great batteries!!! Its hard to get people to believe what a difference there is between a MaxAmps nimh and something like a dynamite until they see it. Great batteries and great run times. Excellent performance right out of the box....great people to deal with....I was a little concerned being in Canada but my package arrived. My E-MAXX loves the new power! Awesome!!!!!!!. Best packs I have ever used. My BL E-Maxx roars wheelies like never before! Easily hits 40+. Rips through anything. Lasst up to 57 minuetes with my setup.